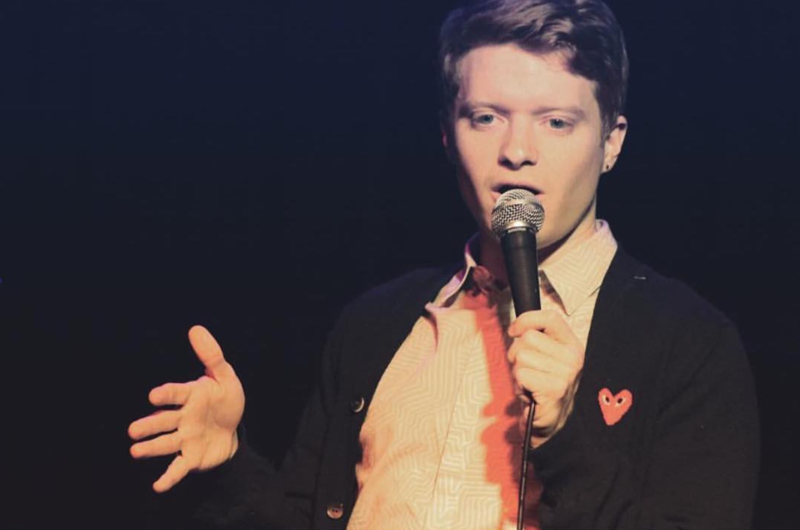 Meet Brendan Scannell; he’s young, he’s hilarious, and he’s currently setting fire to the Los Angeles comedy scene. From stage to screen to everything in between, Brendan’s making a name for himself as an up-and-coming super talent, and we were lucky enough to catch him for a quick Q&A in honor of TodayTix Comedy Month! Read on for Brendan’s favorite places to LOL in LA, and to learn more about his all-time favorite things, from Maria Bamford to Mamma Mia. Hi! I’m originally from Indiana, went to college in Chicago, and have lived in LA for about four years. I started out with improv and sketch in school and in Chicago, and started doing standup when I got to LA. There’s a really great scene here ranging from the clubs to shows in bars, backyards, and everywhere in between. This city is bursting with comedy. In terms of plugs, I host two shows a month, “See What Sticks “at the Complex Theater and “Panic Room” at The Virgil that you should come to if you’ve somehow made it through to the end of this paragraph. And I’m shooting a remake of Heathers for Paramount right now, so check that out in the fall so we get a 2nd season. What do you love about comedy in LA? Because of the entertainment industry, you can see your favorite comedians pretty regularly and in a lot of different settings. You don’t have to wait for someone to come to town because everyone who is established or up-and-coming is pretty much here at least some of the year. I saw Maria Bamford crush in a coffee shop in Pasadena for $5. As a comedian, it means your idols are always around to study, and as an audience you get to see material developed before a special. Maria Bamford, who I mentioned, is one of my favorites. Her perspective is so strong, you really get to see how she looks at the world in her amazing, beautiful way. John Mulaney, Jenny Slate, Marc Maron, Amy Schumer, and Dave Chapelle are people I love as well. I just saw Girls Trip and want to see Tiffany Haddish live ASAP. Sabrina Jalees, Guy Branum, John Early, Kate Berlant, Debra DiGiovanni, Nikki Glaser, Karen Kilgariff, Nicole Byer, I don’t know I could go on forever. Naomi Ekperigin just did my show and was a revelation. She just moved from New York. What shows or venues would you recommend folks check out during TodayTix Comedy Month? Honestly, the key is to not think to hard about it and check out a few different shows at different venues. If you’ve never been, definitely check out the Comedy Store original room and the Improv main room. The shows sometimes have themes, so go on their sites and just pick one you like or with a name you recognize and buy a damn ticket. You’ll see a dozen or so comics you’ve never seen before and get a taste of all the different voices out there. I like “Gays R Us” at the Improv but sought that out cause that’s my community, ya dig? Neal Brennen hosts a show at Westside Comedy Theater on Tuesdays if you live west and are looking for a great lineup. It’s behind the 3rd Street Promenade so you can hit the Nike Store and then see a show in your new kicks. There’s a fun show called “Brewhaha” that Brad Silnutzer hosts. It’s in a backyard, is always jam packed, and the whole show is a drinking game. It’s an example of a house show in LA, which are sometimes the most raw and can really make you feel “in the know” so to speak. If you’re looking for improv, “Cook County” & “The Reckoning” at iO on Thursdays honestly can’t be beat. They’re Chicago teams that have migrated here and are transcendent. “Hot Tub” at The Virgil is on Mondays and is hosted by Kristen Schaal and Kurt Braunohler and always features a great lineup of established acts and up-and-comers. I go to that one a fair amount. I’m one of the mermaids who lure men into the lake and drown them. Making people feel seen and heard. First thing that comes to mind – give us your top recommendations for the following! TV Show: I just watched all of Wet Hot American Summer in a night, so check that out. Play or Musical: Mamma Mia, don’t know if it’s playing anywhere but it should be. Be sure to celebrate TodayTix Comedy Month in LA with no-fee comedy shows and fun surprises, all month long! With your luck, you’ll run into Brendan as you explore all that the LA comedy scene has to offer. Keep us posted on Twitter and Instagram!